I have always been curious about Pulau Ubin – an island off our mainland. For more than a decade, Cynthia and I and some of our friends have been talking about visiting Pulau Ubin. To cycle, or to observe the wildlife. For some reasons, all that talk does not seem to go anywhere. Earlier last year, I have joined a corporate volunteering event to weed at Pulau Ubin. The island is charming. Rural, unlike any place I have seen in Singapore. During my mother’s visit, I brought there her for a day trip. My sister also wanted to join us. So we have five adults and a toddler, eager to explore the very last defender of Singapore’s village living. Pulau Ubin is a 1020-hectare island. It is not as tiny as I thought. It does look like a mini Singapore. The town center is on the south by the shore (just like our mainland!). West side of the island is reserved for Outward Bound. To the east, there is Chek Jawa Wetlands. I laughed when we saw the posters saying that there are wild pigs in the island. Ya right. This is Singapore. Lo and behold, there are wild pigs in Singapore! They were dashing around near the Wetlands looking for, I suppose, food. Cynthia said that the wild pigs are smelly. To be frank, I smell nothing of that sort. I smell only the smell of nature. It was a nice walk from the town center to the wetlands. Armed with the printed guide by our National Park, we could more or less figure out the landmarks and the points of attraction. Cynthia was our de facto map reader. I was hopelessly reading our location off my GPS phone. Fortunately, we have Benny, our real map reader. 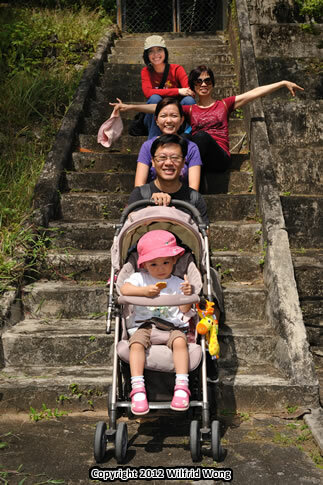 Would you bring a 2-year old toddler to Pulau Ubin? To be honest, it was quite nerve wrecking to get my niece Bethany in and out of the boat. Because in Singapore, these small boats are not secured to the pier during boarding time. They reverse, press against the pier with the engine on, and the passengers then gingerly jump in and out of the boat. As for the walk, majority of the roads are paved. But there are some unpaved roads. So, my sister has to turn back while my mother, Cynthia and I pressed on. Do bring insect repellent. And lots of sunblock. Pictures speak a thousand words. And I have prepared a photo album, just for you. To get to Pulau Ubin, you can take a boat from Changi Point Ferry Terminal. Once you are in the island, you can go on foot (expect hours of walking), take a taxi, or rent a bicycle. Next time I visit the island, I would cycle for sure. And no kidding, there are a lot of wild boars still in Singapore. If you’re keen I can show you the traps deep in the jungle of mandai and lim chu kang area. And they breed like rabbits, hence there are plenty. I know of a seasoned wild boar hunter. He catch average 1 a month. Can sell for $500. Wild boar meat is going for $15-20 per kg in the market. I wouldn’t dare to eat though. And you can actually smell if you’ve stepped into a ‘wild boar territory’. I don’t think they stink but more of the area where they’re residing, they also poo around the same area hence you can smell it when you’re near one. I pick durians often with friends in the jungle and we can easily tell by the smell of it when we stepped into a ‘wild boar territory. Alfred – Woah. I had no idea that there are wild boars in Singapore! I think there was used to be a stall at Rocher Food Center that sold wild boar meat. It tasted pretty good to be honest. Wild boars breed like rabbits?! You may in Singapore, we have natural food that feed the wild boars? That is truly surprising! I think perhaps we did not step into a wild boar territory. The ones we saw wandered around the roads. I wonder what they eat. Do you by chance know? They eat anything they can fine. Fruits basically like jackfruits, durians, rambutans which are aplenty. When they didn’t find any of those, they can even eat roots of plants. I heard from the hunter that they even eat snakes if they come across one. I’m not sure if you’ve did national service but if you’ve done and been to Tekong, there are plenty of wildboars there too and they are a common sight. I don’t think there are that many ‘fruit trees’ there but yet the ‘ community’ seems to be thriving. 1) Run in circles(around something like a tree would be good) as they are bulky hence they will have a hard time turning around while maintaining their stability. 2) Climb up tress as obviously they can’t. If you run with a straight line, they’ll definitely get you and when they get you, it can be fatal because their tusks is sharp and they use it well. They use it to open durian within seconds so you can imagine what they can do to you. And also the other occasion they might chase after you is if they have their offsprings with them – an obvious maternal instinct to protect their offsprings. I still remember the first time I came across a wildboar in LCK area. Scares the hell out of me but it ran away. Soon the ‘running away’ becomes a common sight. There was once a mother was with 3 piglets and the babies basically run around like crazy and the mother didn’t know what to do as it was tempting to run but also didn’t want to leave the babies behind. I ran away instead. The most dangerous to date is a brown cobra which stood up freeze right in front of me and it was as tall as me. There is no way one can outrun a brown cobra as it is seriously quick. I had to stay calm and slowly move backwards step by step. I think it took me 5 mins to make 10 steps. Alfred – You have such passion for wildlife! The ones we met in Ubin seemed to be very much domesticated. They went about doing their own things, sniffing the ground. Maybe those in Ubin are used to tourists? I am not sure if there is a difference between wild pig and wild boar. Those wild pigs I have seen don’t seem to have tusks. Or maybe their tusks are not that big and I failed to notice? Good advice on the wild boar escape strategy! I will certainly keep that in mind. I live near Mandai area. Who knows, I may venture into the jungle one day! Gd to know you finally got to Ubin. Ed – Thanks! We shall go there together one day. You can show us the big lizards! If you mean monitor lizards, I’m susprised you didnt come across any? But you’ll definitely see it in Sungei buloh reserved park. Crocodile too if you’re lucky. Alfred – Is there a timing to the appearance of monitor lizards? I would be very surprised to see one. I have not seen one in my life before! The real one. Not those on TV. Hahaha. No timing. You will definitely see it in Sungei Buloh. Pulau Ubin used to have a lot too but didn’t see any the last time I went. Sure, why not? Ready to do a little cycling too? Ed – Deal! We shall arrange a time to do that. PS. We are not very morning persons haha. JoV – Thanks! Have you been to Pulau Ubin before? Nope. Heard of it but never been there.